Another post from the 'what game could I play' series. 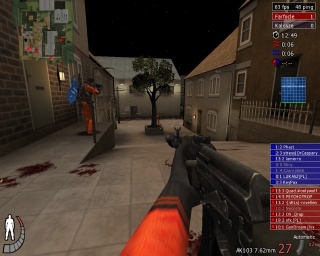 Todays post is about Urban Terror - a freeware FPS based on the opensource Quake 3 engine (technically speaking, UrT is a total-conversion mod for Q3, but hence the enigne is opensource, the game is a stand alone production anyway). Urban Terror is a team-orientated first person shooter, created by SID/FrozenSand LLC, with similar gameplay of what we know from CS. Depending on the game mode, we can play standard 'bombs' (one team has to place a bomb, and the other has to deactivate it, everything of course in the music of countless machine guns), the classical CtF, a little modified CtF called 'Follow the leader', a standard deathmatch, or team survival. 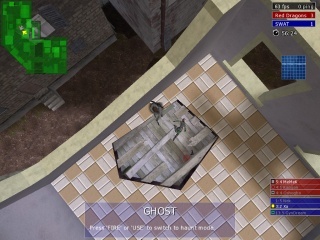 One of the difference between CS and UrT, is that You cannot shoot "through walls" (I miss that ;/), but instead, You get cool features like power sliding or wall multijumping (it's similar to parkout; it let's you get to places You normally couldn't). Also, there is no weapon buying, instead, You get to select a main weapon (normally it's a sniper rifle or an assault rifle), a secondary weapon (like MP5) and a pistol. Then we get to choose on of the two kinds of grenades (smoke or HE, no flashbangs ;/ and they would come in handy), and from 1 to 3 additional items (like a silencer, medkit, laser sight, additional ammo, or very imba night goggles). It's worth noting that when a player gets hit, he starts to bleed (blood on the floor, lowering HP, etc) - to stop bleeding, one has to bandage himself. When someone else bandages the injured, the injured gets some HP restored, additionally, if the healer has a medkit, most of the HP is restored. I said that the night goggles are imba. 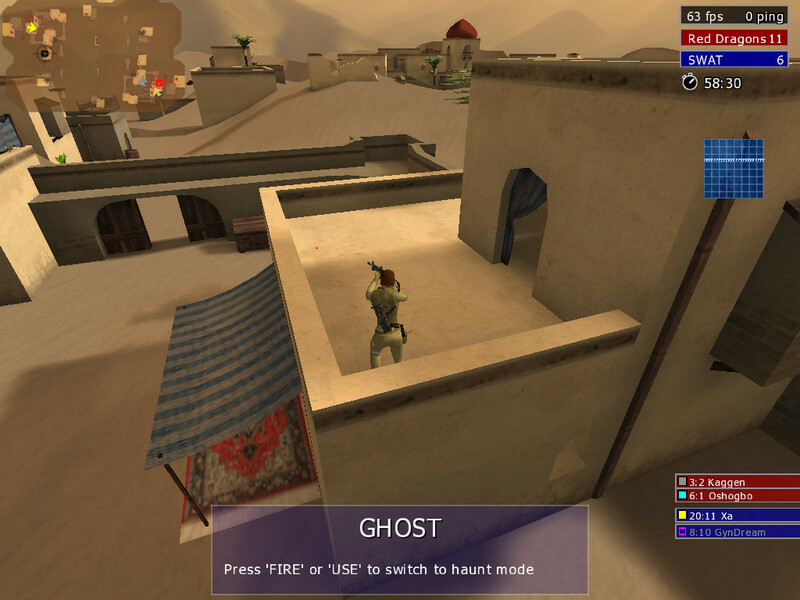 It's so because it not only draws the players in a little brighter color than the background (in the old school green colors ofcourse), but it also marks them on the screen with a visual 'ping' and an animated hard-to-miss rectangle - because of this, you can notice a players thumb sticking out behind a wall in the other side of the map, which normally you wouldn't (it makes the goggles a great camper toy). The authors tried to balance the goggles a little by not displaying the team color when the goggles are on (which isn't a problem if one knows where his team mates are - like looking from time to time on the mini map), and limiting the view (which one can get used to, and isn't a problem for snipers anyway). Anyway, the night goggles were the first and last item we turned off on our private server. As the weapons of war go, the ability to choose is really satisfying - we get few different assault rifles (with the immortal AK-47), two different sniper rifles (one is the 'one show one kill' type, and has a long cooldown time, the other deals less damage, but has a lower cooldown time), a heavy machine gun with a large mag, and a generic assault rifle with the scope being "almost" as good as the ones in the sniper rifles (normally the assault rifles do not have a scope). AS for the secondary weapons, we have MP5 and UMP (which is a little to slow in my opinion), and a shotgun (which is good at short distances). There are also two pistols, and I think they differ only in the BANG! they make - Desert Eagle is definitely lauder. Another thing are the maps. Personally I like two very much (and we played these two on the private server over and over again): Riyadh- a desert map with two groups of sandstone buildings, and a small hill at the center, and Eagle - a English castle with moat, and a piece of town attached to it - the map is very large, but its great - it has many small passages, tunnels, and many different routes from one point to another; the rounds may be little long on it (up to 10 minutes per round), but it's ideal for teamplay imho. Both maps are great for both the players who prefer to be snipers, and for the assault-troop playing style. Other maps are also interesting, and they are create for CtF and 'bombs', and they do really well on public servers. Speaking of the public servers - there are many of these. Currently, the game says that it knows about 522 public servers, from which about 100 are populated. Just to compare, the recently released game Frontlines: Fuel of War, shows about 100 servers, and there are players on only 8 servers. Back to UrT, as far as I've noticed, clans are both visible and active, so I can say that the UrT scene is alive and well being. A little word about cheats - I haven't noticed any. Now a little about the player models and skins - the creators decided to create skins easy to see - so the skins are navy blue or red, and they can be seen from a klick away. Personally, I prefer masking skins, like the ones from BF2142, or CoD4, and I'm not a fan of UrT skins (for our private server, Xa made a few desert and city skins - screenshots are here someplace). The music side of the game is hearable only in the menu. However the sound is on a really good level, starting from the gunshot sounds, up to the radio messages. Way to go! As for graphics, well, this is no Crysis. However, the graphics is rather good, and personally I like it. The system requirements will make people with a little weaker machines happy - the game is only a little more demanding with the old Quake 3, so it runs smoothly even on older machines. EAGLE IS NOT BLOODY ENGLISH. THE SIGNS ARE IN GERMAN! ?